Dr. Magwood and team at Pure Balance NYC teach people to think, speak, and behave in better ways that will transform, uplift and improve their lives and the lives of those around them. Pure Balance Center cares for children with colic, ear infections, asthma, digestive issues, ADD, ADHD and other issues to build wholeness. Pure Balance cares for children with colic, ear infections, asthma, digestive issues, ADD, ADHD and other issues to build wholeness. Dr. Michael Magwood is certified in the Webster Technique. Chiropractic for moms-to-be can provide a more comfortable pregnancy and easier, safer delivery. Innovator in pilates, fitness, yoga, and back care for over 16 years. Dr. Michael Magwood specializes in prenatal chiropractic care for moms-to-be providing safe treatments for a comfortable pregnancy. Providing chiropractic care for all ages with gentle adjustments to address subluxations in the spine and to promote optimal health and wellness. Dr. Michael Magwood is certified in pediatric chiropractic care, a safe and natural way to help children develop to their fullest potential. Dr. Michael Magwood is certified in the Webster Technique, a sacral adjustment for the mother’s pelvic alignment and nerve system function. Wellness is more than just getting the basic level of care. Pure Balance understands and offers all facets for a complete care center. Healthcare decisions don’t need to be complicated and simply put, your health is paramount to us. We know that wellness impacts more than the physical being and our complement services enhance your mind and spirit. At Pure Balance Center, our goal is to provide care to you and your family on all levels. We offer natural chiropractic care, nutritional counseling, mental health coaching, TRX training, IM=X® Pilates programs and spinal workshops. These services encompass our goal to help you reach optimal health and help you be at your best. 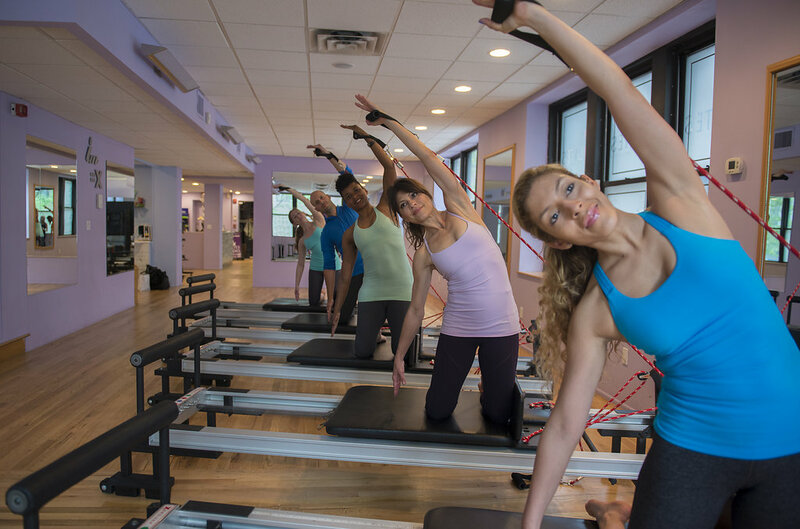 For more than 16 years, IM=X® Pilates has been an innovator in the pilates, fitness, yoga and back care industries in New York City and NJ. Build a rock solid core and increase muscle endurance with advanced TRX suspension training programs – 5 classes for just $200. Health and Nutrition coach Caryn O’Sullivan supports clients who want a positive connection with food and themselves. Bernadette Silva, MA, CRC helps clients make career changes, re-invent themselves and find their true passions by incorporating therapy into their lives. Chiropractic adjustments realign the spinal cord to improve function of the nervous system and alleviate chronic and acute back and neck pain. Infants with colic generally respond wonderfully to the hands of a chiropractor and results are often seen after just one week. Scoliosis is the lateral deviation of the spine and commonly affects children and adolescents which is why early detection is extremely important. Chiropractic care helps children fight off ear infections and addresses the underlying causes of these infections. Dr. Magwood is the best. He could just look at me and know when there was a problem. Not only that, but he could pinpoint that problem exactly. He would hit the spot on the first try and would make it feel better instantly. My daughter had been to many orthopedic physicians, chiropractors, etc. over the course of about 9 years. She has always been involved in athletics and whenever she was injured the course of treatment involved medication and refraining from doing any activity. Until she was treated by Dr. Mag, she never knew she could feel so good and have a doctor understand her needs as an athlete. His staff has been nothing but courteous, helpful, and professional. Thanks, Dr. Mag. Hope those of you that read this will schedule an appointment and let him start helping you, too. Dr. Magwood is a great chiropractor with an intuitive touch! More than 6 years ago (I lost count), he healed my chronic neck pain – my story was published in the Clifton Merchant magazine. Before that time, I could not do any needlework for more than 3 years! I was and am grateful for his treatment. Recently, I began to receive treatment for my osteoarthritis. His adjustments and care, along with exercise, are helping to release tension and reduce pain. I’m also comfortable with his assistant, Dr. Matt. His office manager, Jillian, has always been helpful and cheerful. Looking for our Clifton, New Jersey location?